Be the first to share your favorite memory, photo or story of Jacqulyn. This memorial page is dedicated for family, friends and future generations to celebrate the life of their loved one. JACQULYN JENSEN, age 67 of Nebraska City, NE, formerly of Sidney, IA and Syracuse, NE, died Friday, February 8, 2019 at Nebraska City Care and Rehab Center following a brief illness. Jackie was born February 17, 1951 in Denver, CO to Robert K. Jeffrey and Marcella C. (Kruetzer) Jeffrey. On November 3, 1974, she was married to Roger Jensen in Denver, CO. Jackie worked as a Medication Aid in several area Nursing Homes. Jackie was preceded in death by her parents and husband, Roger Jensen. 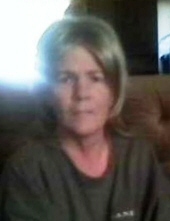 She is survived by 3 sons, Trent Jensen of Marysville, KS, Clint Jensen of Pawnee City, NE, and Brent Jensen and wife Nikki of Nebraska City, NE; 9 grandchildren, Ashley Hartman, Brandon Hartman, Emily Hartman, Madison Jensen, Johnny Teitge, Joshua Teitge, Giovanni Chaney, Kailyn Jensen and Eliana Jensen; 4 sisters, Bobbie Rasmussen of Aurora, CO, Debbie Vaughan of Centennial, CO, Maryann Widtfeldt of California and Patty Branca of Denver, CO; numerous nieces, nephews, many other relatives and friends. Graveside services will be 2:00 PM Wednesday, February 13, 2019 at the Thurman, IA Cemetery with Rev. Jan Phillips of the Thurman United Methodist Church officiating. Visitation will be open from 9:00 AM Wednesday until service time at the Crawford-Marshall Funeral Chapel in Sidney, IA. A memorial fund has been established. The Crawford-Marshall Funeral Chapel in Sidney, IA is in charge of arrangements. To plant a tree in memory of Jacqulyn Jensen, please visit our Tribute Store. "Email Address" would like to share the life celebration of Jacqulyn Jensen. Click on the "link" to go to share a favorite memory or leave a condolence message for the family.